Perth Fashion Festival gives WA Designers a fabulous opportunity to show a ‘capsule’ collection alongside several other labels. Designer Capsule #2 featured Wild Horses, Steph Audino, Betty Tran and Bikini Atoll. 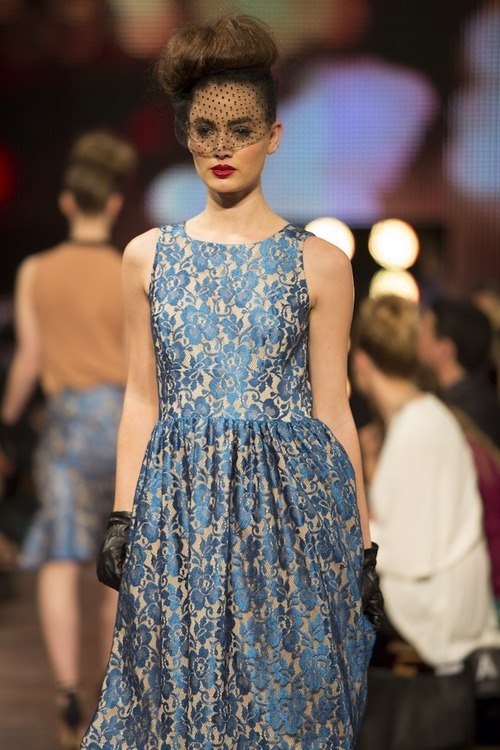 1… Natalie Donovan’s, WILD HORSES Label opened the show. Raw, edgy, yet glam streetstyle using silks, leather and metallics. A floaty ‘leg action’ maxi (see below) added wow factor. Wild Horses unique accessories, jewellery and clothing can be found at Hatch in enex100. 2… Next up came WA darling STEPH AUDINO. Steph’s stunning gowns and dresses featured strongly throughout PFF. They were worn by many TV Presenters and Perthonalities, including singer Samantha Jade. Steph’s gowns are designed for the modern woman. Perfect red carpet kerpow! Steph has her own showroom in Inglewood and her clothes can also be found at Hatch in enex100. 3… Next up was BETTY TRAN’s Parisian Chic Runway Style. Betty’s recent trip to Paris has played a big influence on her designs and the collection. Lace, brocade, netting and gloves featured strongly. Betty Tran has two stores. Her original flagship store is in Raine Square in the heart of Perth city. She also has a new ‘French’ themed store in Times Square, Claremont. 4… Finally the stunning ‘Revolution’ collection by BIKINI ATOLL. Although Bikini Atoll was only established in 2011, Designer Louise Bond has been involved in the swimwear industry for over 20 years. Bikini Atoll chooses the most ethically responsible suppliers available and makes swimwear that actually fits real women! Cheers to that!! Teensy weensy, itzy bitzy kinis, with floaty kimono throw-overs. To a full brief and bralet. Lazer cut and metallics featured. Finale walk for Bikini Atoll. Louise’s darling son stole the show!